Not a lot of cooking going on in my kitchen lately. In fact, I feel a bit like I’m reverting back to my bachelorette habits. The trouble is that both my husband and I have been traveling quite a bit for work and it never seems to make sense to invest in groceries for the few days that we are both home. It’s gotten to the point where my fridge is well stocked with beer, wine, condiments, and not much else. Luckily, the beer is from a recent beer & chocolate run over the border to Belgium. And so that is what I served with this week’s French Fridays with Dorie recipe, Cheese & Olive Bread. I’m no wine or beer pairing expert, but I will say that this made a very satisfying late night dinner after a long work day. This is our second foray into cheese bread with Dorie and I must admit to a slight preference for the Savory Cheese and Chive Bread. But it was pretty tasty with olives too and, with so many possibilities, there’s no going back now. This entry was posted in french fridays with dorie and tagged Around my French Table, bread. Bookmark the permalink. Oh, I get it. There are times when we all live like nomads in our own house – milk and cereal is a friend during those times. Thanks for your comments on my photos. I’ve been so sad to hear of the flooding over there – every place we visited seems to be partially underwater. I hope you’re staying safe & dry! You do realize that beer is liquid bread. I hope your life settles down enough for you to start stocking your fridge again. Your bread looks lovely. I agree with you. Between the two, I definitely prefer the cheese and chive savory bread. It looks very nice Rose, but I agree the cheese and chive is much better. A glass of wine tips the scale a bit though! Your fridge is well equipped in my opinion… Have a good weekend! Beer and bread sounds perfect! I have also lost my kitchen mojo a bit because work is sapping all my energy. Have a great weekend. Trappist beer is good with any bread, and this bread would be good with any beer. Sounds like a win-win to me! 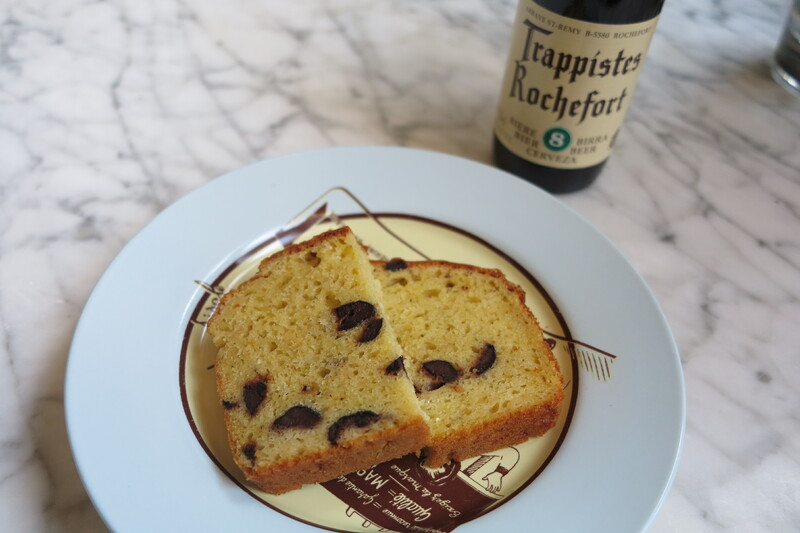 Rose, your quick bread with the nice large chunks of black olives looks wonderful – glad that you found the time to bake this and enjoy it with a wonderful Belgian ale. Noch ein schönes sonniges Wochenende! I thought hard, really hard, and can find nothing wrong with Trappistes Rochefort, Belgium chocolate and cheese and olive bread for supper. The only problem with the picture is that we couldn’t get a glimpse of the chocolate! When I was a kid, we used to make a run from where I lived in Iowa, to Colorado, to buy Coor’s Beer because it was sooooo good and wasn’t sold outside of Colorado. Is that the equivalent of making a run from Germany to Belgium for beer and chocolates? Yes, that is exactly the same idea as a beer run to Belgium. It looks very tasty and I’m sure it went great with beer! I am so jealous right now!! Your bread looks fantastic and the Trappist makes a very good pair for it! I said that this is a very good bread to pair with wine but now I am tempted to make the bread again and try it with a Belgian beer instead!! I love the idea of making a beer and chocolate run to Belgium. I used to go to Canada for beer when I was in college, but that was before the craft beer craze here. Now American beer is much better than it used to be. I preferred the texture of the chive and cheese loaf better, but might try adding olives to that recipe. Happy travels. You’re so lucky that you can do a regular “beer and chocolate run” to Belgium 🙂 Your cake/ bread looks wonderful! These slices were very filling! I agree! I preferred the other cheese quick bread too. I am so jealous of your beer and chocolate run to Belgium. I love Belgian chocolate and have always wanted to go!